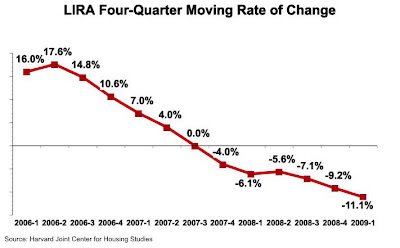 The Leading Indicator of Remodeling Activity (LIRA) from Harvard's Joint Center for Housing Studies sees a slumping economy and struggling housing sector continuing to hold down remodeling spending, a trend which will continue and intensify at least through the first quarter of 2009. Remodeling spending was down 5.6% in the second quarter of 2008 from the level in the third quarter of 2007. Harvard predicts spending will slump 7.1% from that third quarter in the third quarter of this year, decline another 9.2% by year's end, and be down 11.1% by the end of the first quarter of next year.